Do you often rush home from work, only to find a nearly empty fridge and a couple of hungry, moody kids? Include some easy, healthy habits into your jam-packed days and you’ll never eat junk food again (unless you really crave it, of course :-)). Healthy meals don’t necessarily require daily shopping expeditions. If you shop smart and stock up on the right foods, you can whip up a healthy, nutritious meal in no time. When choosing fats, pick unsaturated fats over saturated or trans fat. They are good for your heart, cholesterol and overall physical and emotional health. When shopping, go for olive oil or peanut oil instead of butter. Not all frozen food is bad: frozen fruits and vegetables are often just as good frozen as fresh, because they are processed immediately and retain their nutritional value. Frozen fish is a good option too. Especially fatty fish (e.g. salmon and trout) increases your intake of healthy omega-3 fatty acids, which protect against heart disease. Dried spices and herbs such as paprika and chili are packed with minerals, antioxidants and anti-inflammatories. For example, chili powder can help speed up your metabolism and improve circulation. When fresh herbs aren’t an option, this is your source of both flavor and nutrition. Always keep in stock onions and garlic: if you store them correctly, they stay firm and fresh for months. They offer a strong flavor to just about any dish, and they have powerful cancer-fighting and cardiovascular effects. Nuts and seeds are full of healthy fats, minerals and protein. You can use them for cooking, baking, snacking, breakfast. Most nuts will last up to a year if you keep them cold. 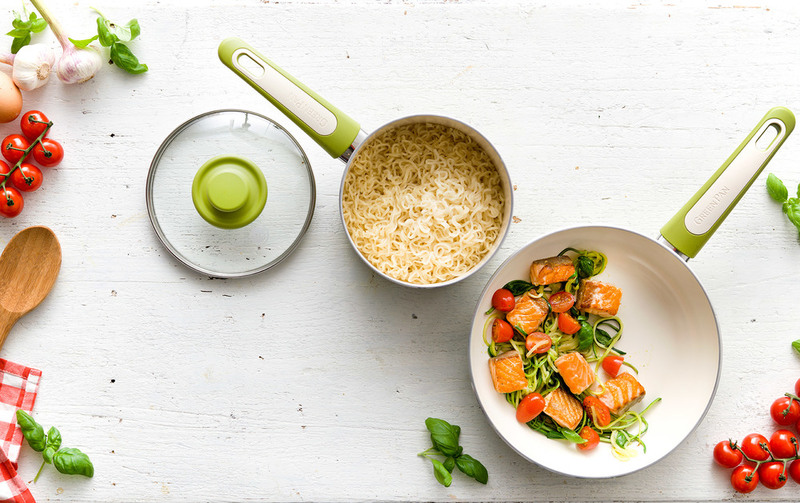 Can you have a healthy dinner ready in only 20 minutes? Yes, you can! For the marinade: in a bowl, mix the olive oil, garlic, paprika, chili powder and grated lemon rind. Season with salt and pepper. Pour the marinade over the cubed salmon and leave to marinate for a few minutes. In the meantime, use a julienne cutter to slice the courgettes/zucchini into ‘spaghetti’. Heat the peanut oil in a pan. Sauté the courgette/zucchini spaghetti and garlic for 2 minutes, until transparent. Season with salt and pepper and remove from the pan. Set aside. In the same pan, sauté the salmon for 3 to 4 minutes until tender. Remove the salmon from the pan and briefly sauté the cherry tomatoes. Return all the ingredients to the pan and warm briefly over a high heat. Garnish with fresh basil. P.S. Look out for our next blogpost about busy life and healthy habits. Our tips can save you time, trouble and maybe some pounds!